Car maker Henry Ford often gets credited with developing the modern assembly line. The fundamental idea of an assembly line is to compartmentalize labor into highly specific tasks to increase output while minimizing cost. Workers need not be highly skilled or trained, they just need to be able to repeat a single task. As with many great inventions Ford built on the work of his predecessors. Chicago industrialist Philip Armour revolutionized the meat packing industry by compartmentalizing labor in his factories long before Ford. Armour was in fact notorious for his implementation of unskilled labor. He intentionally pitted worker demographics against each other with the purpose of keeping labor costs low. In the early days Armour factories were dangerous places and the workers were prevented from joining a union. Armour and another local meat packing company called Swift led the market in using refrigeration to decrease cost. In the days before refrigeration meat spoiled very quickly. Shipping live cattle by rail to local butchers was a costly enterprise that the railroad companies profited greatly from. Armour and Swift began shipping their cuts of processed meat in refrigerated cars, which vastly expanded their markets to the every corner of the nation. The photo above shows one of the massive refrigeration units used. 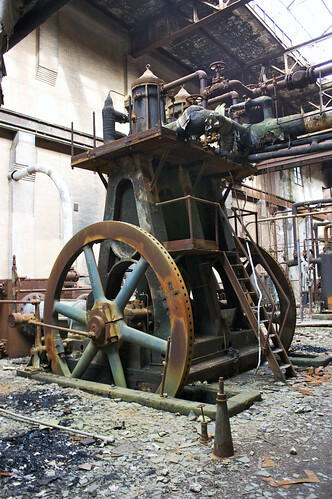 The side of the machine says that they were produced in 1902 by De La Vergne Refrigerating Machine Company, New York. There are two units currently residing at this Armour plant, though I believe there may have been three. The concrete floor has divisions for a missing unit.